The ability to describe a database using the Entity-Relationship model is delivered by the Entity-Relationship Diagram (ERD) solution. This solution extends ConceptDraw DIAGRAM with 2 libraries that contain 45 objects advocated by Chen's and Crow’s Foot notations that can be used when describing a database. Open the Chen ERD, or the Crow's Foot ERD template from the ERD solution. Add objects to the diagram by dragging them from the Chen ERD, or the Crow's Fot ERD library to the document page. Use the Action button menu to change diagram elements. To open the menu select an object and click the button in the upper rig ht corner of the object. Format your diagram by using Line, Fill, Shadow and other options provided in the Format panel. 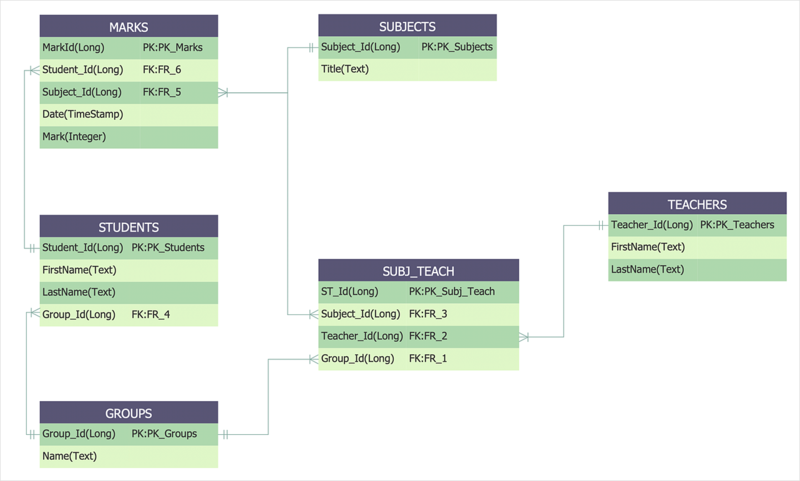 Result: Entity-relationship diagram (ERD) represents a data model describing relationships between students and teachers.